Hundreds of Kenyans could lose their vehicles after it emerged that employees of the National Transport and Safety Authority (NTSA) are cloning number plates and fraudulently registering cars for sale. “For example, if someone in Nairobi wants a cloned number plate, the registrar will find a vehicle whose owner is in Mandera, Garissa, Mombasa, Kisumu or anywhere far from the city. "He will also ensure that the number plate of the car is not on the police radar, or somewhere in a police station,” the investigator said. The vehicle specifications are then extracted from the owner’s logbook on the NTSA website, including colour, chassis/frame number, year of manufacture, transfer number, owner’s name, make, body type and other details. A copy of the owner’s ID is also downloaded from the website by the insider. “Once these have been extracted, the details are handed to the person who made the request. 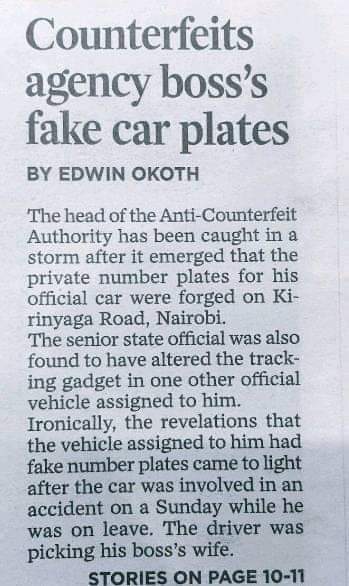 They then make a fake logbook elsewhere, go to a police station to get an abstract for a damaged or lost number plate and then go back to the NTSA to apply for the number plates,” the officer said. Thereafter, the insider again liaises with the vehicle inspection department to get a certificate without having an inspection done. He also links the "owner" of the car with an insurance broker to obtain a sticker. I like your first statement, Kenyans are rotten to the core. Is the registrar the man we saw in court? Sometime back the gok proposed digitizing this but Kenians were up in arms opposing. We are in a country where car registration sounds like rocket science in this time and era......uhh! !.....Time to send our Mpigs and Senators to Botswana to learn how they carry out an efficient and foolproof cattle registration process. Is your number plate digitized does a computer somewhere decide what number comes next? I'm surprised that people are surprised about this in this Kenya of ours where you can be sold for cut chalk as medicine. All these offences should just attract the death penalty. Tunyonge watu hapo Uhuru Park, see how fast order is restored. BIG HEADS SHOULD ROLL FOR THIS! Interesting. I didn't know this practice had continued though albeit with some more boldness. In the old days when the employees in the registrar of motor vehicles was in KRA they used to do this. Mostly i remember was for motor vehicles imported through the Somali border. Illegally. so here you are with a vehicle with no registration plates. what to do, you search for motor vehicle in garage or wherever which is a scrap and can never be driven again. you go with the registration and have the changes made to reflect the vehicle you smuggled in and wala! (i have simplified the process) you have fully registered motor vehicle which you can drive around in Kenya. i guess they inherited this from the KRA.